In 1888 Petrie discovered a Middle Kingdom workmen's town at Kahun. These craftsmen worked in the temple workshops built by Sesostris II and lived close by, within a walled enclosure. The town's architect had set out rows of terraced houses of about 50 metres in length, each branching at right angles from the enclosure wall and separated by a street. These parallel streets joined a central avenue which led to the temple complex and its workshops. Each house had a wooden door that was set within an arched brick entrance. The pivots on the edges of the doors were set into holes in the floor and the arch above the door. These dwellings had a number of small rooms, some of which were covered with a barrel vault while others were spanned with large wooden beams which were covered with thatch. Some roof spans had to be supported with wooden pillars. The setting out of the house rows was very precise and the shape and size of rooms were strictly controlled. The walls were plastered with daub and painted yellow. Some were decorated with paintings - one depicted a wooden vase stand, an early example of trompe-l'oeil. Beneath the floors of these houses were found the poignant remains of babies who had been buried in small rectangular boxes by their parents. Such boxes would also have been used, more mundanely, to hold tools and other domestic items and were made from planks of timber fixed together with dovetailed mitre-housing joints (figure 49). Furniture made of wood and even sometimes stone was commonly used in these houses. Petrie discovered an animal-leg chair with a slanting back support which was held to the side seat rail with an angled bracket fixed with small dowels. within the temple complex. In a small hole a number of chisels and an adze blade were found. Petrie also discovered many other metal carpentry tools on the Kahun site. These tools were made from bronze, an alloy of copper and tin. This technological advance in tool manufacture is first identified in Egypt during the Middle Kingdom, Perhaps bronze was imported from Syria in ingot form during this period. Again the quality of carpentry improved as this new material was used. Blades made from bronze are harder, and therefore retain their cutting edge longer, than copper tools. During the Middle Kingdom boxes were customised and used for special purposes. One interesting type contained eight small alabaster vases which held perfumes and oils. A tray cut with holes was placed inside a simple rectangular box to prevent the vases from moving and being damaged. The tray often fitted tightly and finger holes or a slot were cut through the centre of the tray to help with its removal. A beautiful toilet box was also discovered here at Kahun by Petrie. It had belonged to a daughter of Sesostris II, Princess Sit-Hathor-Yunet, whose tomb, which was close to her father's pyramid, contained jewellery and a number of boxes. These boxes had decayed, leaving only the ivory inlays and the applied decoration of gold Hathor heads, carnelian and faience. Two boxes were successfully reconstructed by the conservation department of the Metropolitan Museum of Art, New York, where they are now displayed. Both have shrine-shaped lids, while one has been divided into compartments to hold the princess's toilet equipment. This consisted of a polished metal mirror, cosmetic containers, a silver rouge dish and a razor and whetstone. 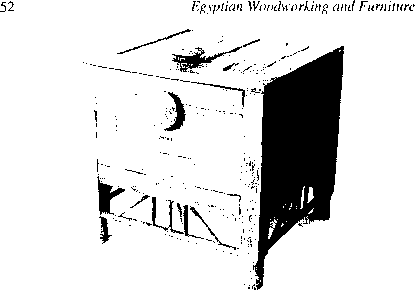 Scribes also used wooden boxes to store their pens and writing material. They were often left plain, or they were painted to suggest cedar panels, with ivory and ebony inlay.